Street Fighter Alpha 3 Game (Sony PlayStation 1, 1999) - PS1 - Boxed, No Manual. Condition is Acceptable. Dispatched with Royal Mail 1st Class Large Letter. Box isn't in great condition so you may want to swap into a cleaner ps1 box, disk tested and works fine. No manual. Title: TEKKEN 2. Platform: Sony Playstation. Region: PAL. Tekken 3 (Sony PlayStation 1, 1998). Condition is Very Good. Dispatched with Royal Mail 1st Class Large Letter. Title: Wu-Tang: Taste The Pain. Platform: Sony Playstation. Region: PAL. Platform: Sony Playstation. Region: PAL. PS1 Tekken 2 (Sony Playstation 1). Condition is Very Good. Dispatched with Royal Mail 1st Class Large Letter. 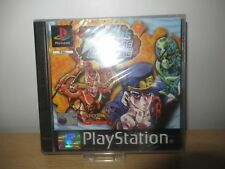 Street Fighter Alpha Warriors Dreams (Sony PlayStation 1) Rare Ps1 Game. Condition is Very Good. Dispatched with Royal Mail 1st Class Large Letter. Zen-Nippon Pro Wrestling - PlayStation NTSC-J. The case is in good condition, a few light scuffs, no cracks or broken hinges. Manual included and in good condition. Rest of World. Playstation TEKKEN GAME BUNDLE / JOBLOT TEKKEN PLAYSTATION GOOD CONDITION . Condition is Good. Dispatched with Royal Mail 1st Class Large Letter. METAL GEAR SOLID for Sony PlayStation PS1 - 100% Complete - 2 Discs. Condition is Very Good. Dispatched with Royal Mail 2nd Class. Small damage inside the case (pictures) but the disk still clips into the spare disk holder on the other side as it is a big box. Wu-Tang Taste The Pain ps1 pal includes manual. Wu-Tang Taste The Pain ps1 pal includes manual. . Condition is Acceptable. Dispatched with Royal Mail 1st Class Large Letter. The front of the case is broken but everything else works and looks fine. 5 out of 5 stars - Wu-Tang Taste The Pain ps1 pal includes manual. 2 product ratings2 product ratings - Wu-Tang Taste The Pain ps1 pal includes manual. Rival Schools: United By Fate - PlayStation NTSC-J. The case has a broken hinge. Rest of World. Grab yourself a bargain! Box - hinge intact, good overall condition. The fights take place within incredibly detailed, scrolling levels, and each of the 14 characters features a distinct fighting style. You can ambush other players, 2 against 1 allowing for all-out thrashings. PS1 Tekken 2 (Sony PlayStation 1) PAL. Condition is Acceptable. Dispatched with Royal Mail 1st Class Large Letter. Works fine comes with manual, however the case is broken but still has a use. We are a team of nine based in a 2,500 sq/ft unit in a gated industrial park in South Manchester, UK. -If your friends think your skills will not win the Relic, challenge them to a match with the Two-Player mode. Grab yourself a bargain! Box - cardboard collectors case. Tekken 3 | Used. To lure it out of hiding will take the greatest fighting contest the world has ever seen.Tekken 3. Platform PlayStation. (If applicable) Preorders. Grab yourself a bargain! Box - hinge intact, good overall condi tion. Soul Blade/Edge - PlayStation NTSC-J. The case is in good condition, a few light scuffs, no cracks or broken hinges. Rest of World. MORTAL KOMBAT 3. FOR PLAYSTATION ONE. While evil forces are in pursuit of the all-powerful Infinity Gems, the Marvel Super Heroes must fight for the good of all mankind! Play as any of the 12 characters from the Marvel universe and master a variety of powerful attacks, super moves and multi-hit combos.